Living a day in Pampanga wouldn’t be completed without having a glance to the state of the art, majestic Mt. Arayat. By the way, I’m still on my 3rd year in Angeles City and back then, I’ve been dreaming to step a foot at the peak of the mountain. Actually, this climb to the peak is not my first time because last year October, I and Kuya Allan had attempted to trek to the South Peak. It was an unfortunate time for us because we got lost on trail and slippery road, long-grown cogon grass slow down our pace. In the end, we only reached nearly one-fourth of the South Peak but it was worth a try I guess. Anyway, for the record, we finally made it through on our North-South Peak traverse. This time, it was a wise and well-planned mountain trekking. 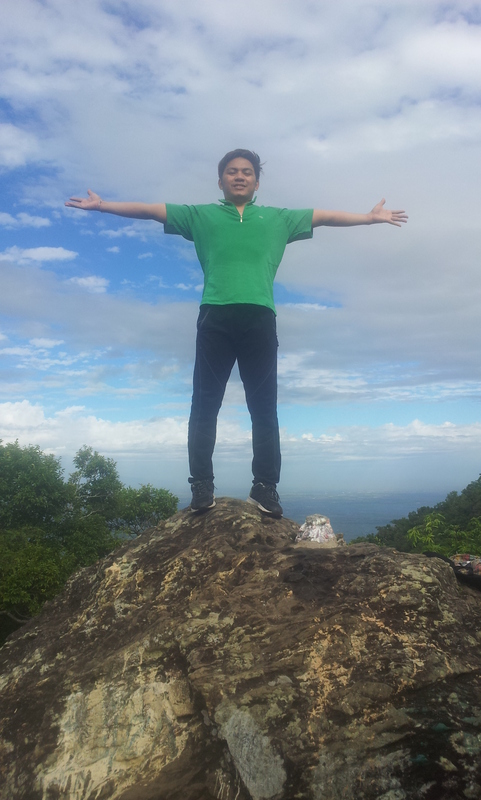 Kuya Allan joined a climb last December and he made to traverse. He was inspired to do it again and so, he organized the climb and contacted the same mountaineering tour guide. There were 7 of us who participated and we paid 400 pesos individually inclusive of transportation from Angeles to Magalang and Arayat to Angeles, entrance fee and one guide who will assist us along the way. If we happen to initiate a DIY climb, it will really cost us much considering the back and forth transportation and the guide fee. So, I suggest you to organize the climb and contact a guide. By the way, it is required to hire a guide if you plan to go on a traverse. Thorough preparation is a must before going on a climb. It is very important to secure lunch, 1.5 to 2 liters of water, rope (you might be using it), and some energizer like chocolates. Take note, no source of water can be found in the mountain. So, it is best to bring appropriate amount of water depending on your consumption. 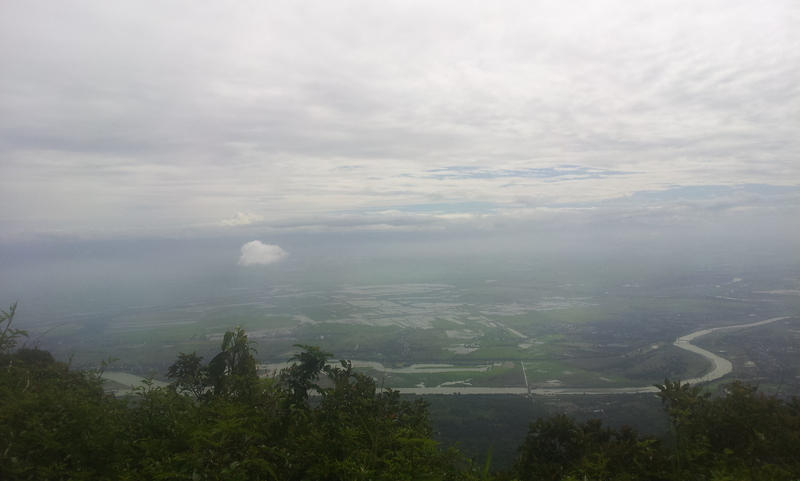 Mt Arayat towered at 1,026 meters or around 3,336 feet above sea level. It is 12 km distance from north to south and it takes 6-9 hours to go on traverse depending on the pace. It has three peaks to conquer, Pinnacle Peak, South Peak and the North Peak as the highest. Mountaineers marked Mt Arayat 5/9 as of its level of difficulty. Mt Arayat is a protected National Park and it’s considered as a natural habitat for endangered flora and fauna. It was a fair and a wonderful morning when we started the climb. Our guide Kuya Ben told us that it will take us 3 hours to reach the North Peak. We started around 7:00 in the morning and we anticipated being there around 10:00 AM. Way up is very challenging because the more you go farther, the more it gets steeper. On the first hour, it was bearable but on the latter hours, I can hear my heartbeat mumbled because it gets tougher as I couldn’t imagine. You won’t be easily lost on the mountain because there were trails marked in yellow paint that you need to follow. On some areas, be attentive to the crossed mark because it might be a dead end or a cliff. On the other part, one thing that eased the pain and made me forget that I’m exhausted is this amazement that I’m feeling inside. Savoring that precious moment in the forest would actually lose you in time. It is not hot inside as I first think of it. Tall trees gave us a perfect shade and a fresh supply of air. If you are going to start in Magalang, you shouldn’t miss to have a detour to the White Rock on your way to the North Peak. If you happen to reach that part, you’re already in the middle part of the peak. Legend said that this place is where Maria Sinukuan, a fairy who is protecting the entire mountain, lived. 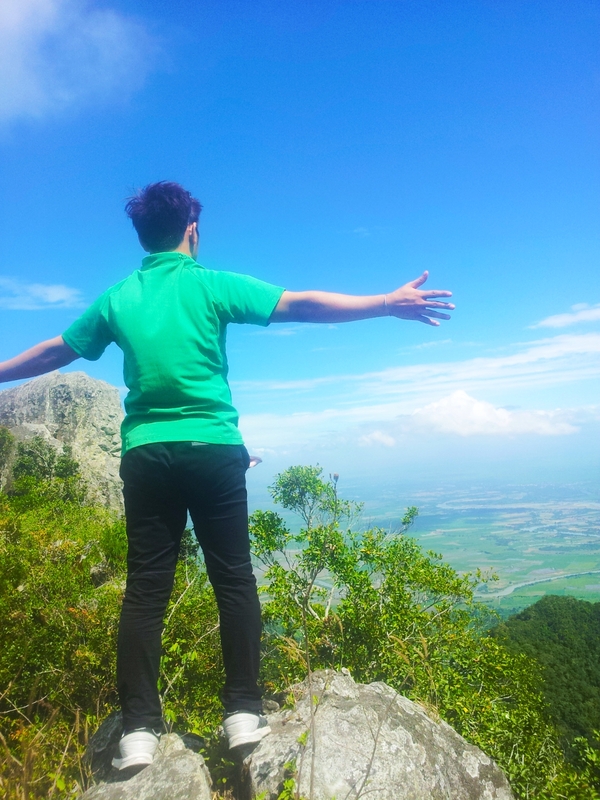 Definitely, White Rock offers a tremendous landscape of municipality of Magalang. Also, it gives you a spark of excitement as of what would it be like when you’re actually be in the peak. Being there feels amazing, how much more up there? Personally, I didn’t miss the opportunity to capture this very moment. There is an elevated rock and it is a perfect spot for you to stand up and have your oblation pose. Alas! We reached at the top around 10:20 AM. Instead of resting up for a while, I hurried to the cliff and had a grip on my phone to take selfies. The view is overwhelming and it is something that you must not overlook. For a while, we took a rest and regained our strength. There is a small shade up there where you can sit down and relax and enjoy your foodies and goodies. Honestly, what is only disappointing in the North Peak is the waste gathered brought by various group of climbers who irresponsibly leave their wastes. As our guide once said, “You were able to bring your water bottles and other food wrapper/container up; you must learn how to bring it down.” Indeed, it is true. Responsible climbing is a must. We were enjoying the beauty and being satisfied by this natural resources; we must not help it being destroyed due to our irresponsibility. If you are to look Mt Arayat from afar, you will only recognize the two peaks. Nonetheless, drawing closely would lead you to realization that in the middle of it lies the not-so high peak which they called The Pinnacle Peak. The Pinnacle Peak is best described of its boulders of white rock. The challenges going to that peak are the steep terrain and these thorns and thistles of some kind of plant. I suggest bringing a pair of gloves to avoid being pricked. The temperature is chilly and air breeze is absolutely fresh, free from air pollution. This part is very tricky and risky. So, extra caution is a must. We had our lunch on the peak. 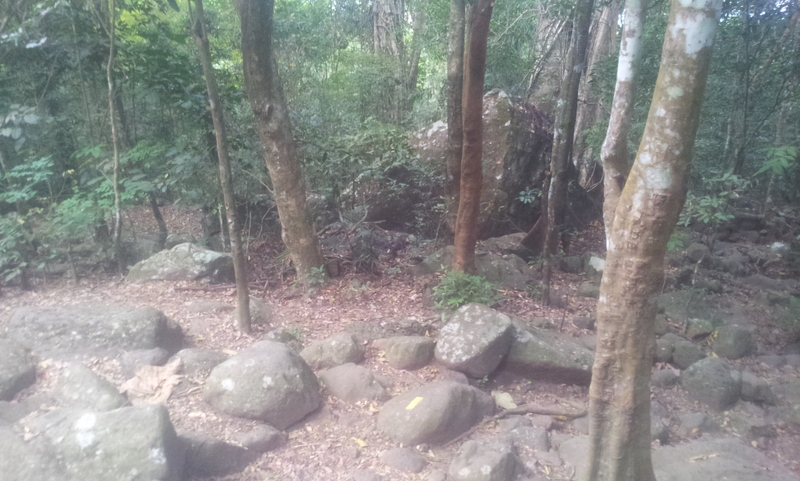 There was a particular side of the rock boulders where you can eat and enjoy the astounding view of mountain ridge. I, Kuya Allan and my sister happened to climb the rock boulder with the assistance of our guide. It was dangerous but I’m up to it. 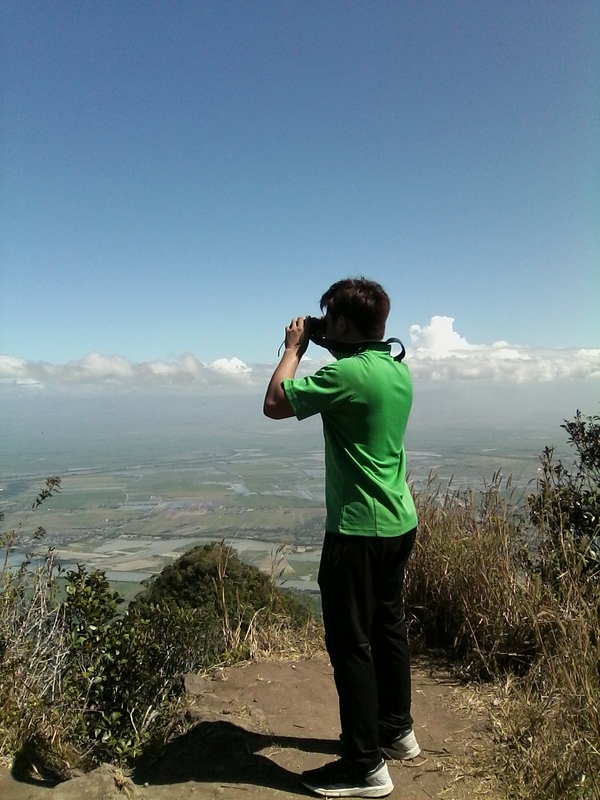 Upon reaching the South Peak, something that you should not miss also is to spot the spectacular view of Candaba Wetlands. They called this area “View Deck”. We are fortunate enough to borrow a binocular from one guide who was taking a rest in there. That completed our viewing experience. Going down from the mountain took us 2 hours. We thought before that going down would be a lot easier than climbing up. Unfortunately, that was actually a horrible assumption. My knees started to rattle and I kept my balance as my body was dragged down. You know what, the south part of the mountain is covered by vast large tall trees and it was sort creepy. Still, it was fun and thrilling. When we reached plain ground, we rested for a moment and then, later on, our service arrived and we head back home.